The great Depeche Mode played the Shoreline theater last week to a sold out crowd of devoted rapturous fans. I was there for every note with my soul mate and a couple of our best friends. This is a band that’s truly weathered time well – singer David Gahan still bumps, grinds, and belts out the deep notes with aplomb. Singer multi-instrumentalist and principal writer Martin Gore raises the stakes whenever he comes out to be front and center, most notably on this tour performing slow acoustic versions of “But Not Tonight”, “Home” and “Shake the Disease” hitting all the best long vibrato soaked tones perfectly. Andy Fletcher does his low key celebration in back. A drummer and second instrumentalist round out the band for their live shows as they have for just over 10 years now. The group was out to promote their latest release “Delta Machine” – an album that’s surprisingly good for writers so well into their careers. From the opening track, also played to start the show, “Welcome to my World” to “Angel”, “The Child Inside (another Martin slow burner) and “Soothe My Soul” (a classic form for David’s best delivery) they covered many of its high points, all of which fit nicely in their catalog. These new tracks serve to update the Depeche Mode sound, even hinting in parts at dub-step electronica, a variant on the form they practically invented along with German forbearers Kraftwerk. Of the later work, only 2005’s “Playing the Angel” was represented with two tracks – “A Pain That I’m Used To” and “Precious.” The rest of the set list focused on the band’s 80’s and 90’s hits including 1981’s “Just Can’t Get Enough”, skipping to 1985’s “Shake the Disease”, 1986’s “Black Celebration”, “A Question of Time”, and “But Not Tonight”, 1987’s “Never Let Me Down Again” (encore with everyone’s arm wipers to augment it), 1990’s “Enjoy the Silence”, “Personal Jesus”, “Halo”, and “Policy of Truth” (all practically required for these shows), 1993’s “Walking in My Shoes” and Martin’s tear jerker “Home”, now a perennial favorite from 1997. Not as fond of the other selection from “Ultra”- “Barrel of a Gun” which ended up being one of several instances where the drummer drowned out the founding members – a minor complaint, but here’s one fan wishing they more frequently dispense with the live drums. The whole event proved that Depeche Mode has remained not only commercially viable, but in rare form artistically, delivering their sometimes gloomy but more often celebratory wares, aged appropriately and served up hot. When I was discovering classic and progressive rock music back in the 70’s, Black Sabbath was on the outs in my circle of friends. Their lyrics, presence and brand all shouted ‘satanism’ and ‘occult.’ The fantasy elements of Yes, Genesis, Camel and their ilk seemed more welcoming to our young minds. So, I never collected Sabbath recordings and did not attend any of their shows, nor did I know anyone who did. As their influence spread and drove the heavy metal movement over time I also stayed away, even though I became enamored of the goth movement in the ’80’s, and even later, knowing that Ozzy Ozbourne actually had become quite an entertaining front man and TV personality and that Dio had become one of the best metal vocalists ever, not to mention the fact that Toni Iommi kept showing at the top of guitar players popularity polls. All of that changed for me earlier this year when I read of Toni’s illness, recovery, and the rebirth of his classic guitar techniques on the new recording ‘13‘ – hailed as a metal masterpiece and return to form from these survivors. I downloaded the tracks and instantly loved the album. This led me to look into their past work to discover what I had missed. In fact, while several of their most popular tracks present the occult, more of them are about other topics well suited to aggressive rock – the folly of war, drug addition and other social ills. Heck they even sang about fairies with boots! Often there were long instrumental breaks with a clear blues-rock vein, at times reminiscent of early blues based Jethro Tull, with a sometimes ‘progressive’ approach to songwriting, as many of their best tracks switch keys and rhythm as they unfold. 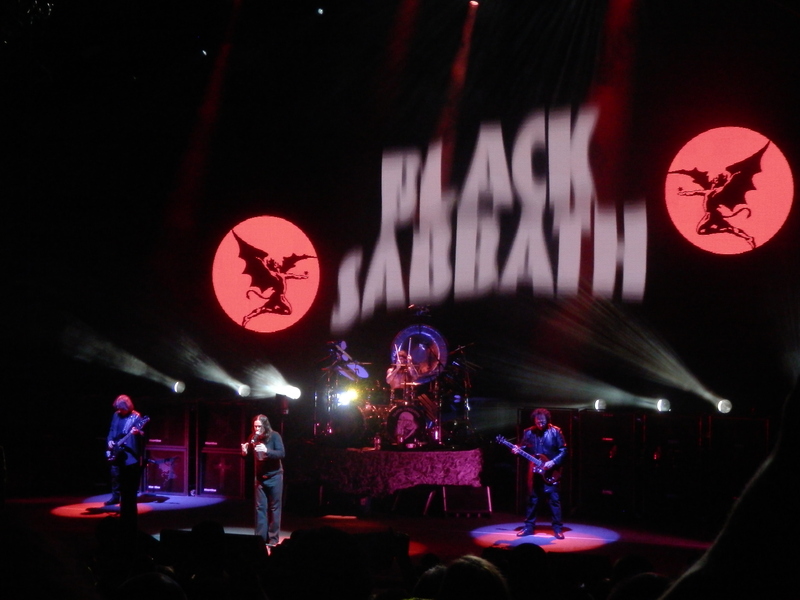 Therefore it was with great anticipation that we finally attended the most recent Black Sabbath show at the Shoreline Amphitheater on August 26, 2013. And it was everything I hoped it could be – great set list, Ozzy still an energetic front man, able to sing and deliver the old and the new work, Toni in rare form ripping through his riffs, and Geezer proving why he’s been one of the most celebrated bassist in rock. 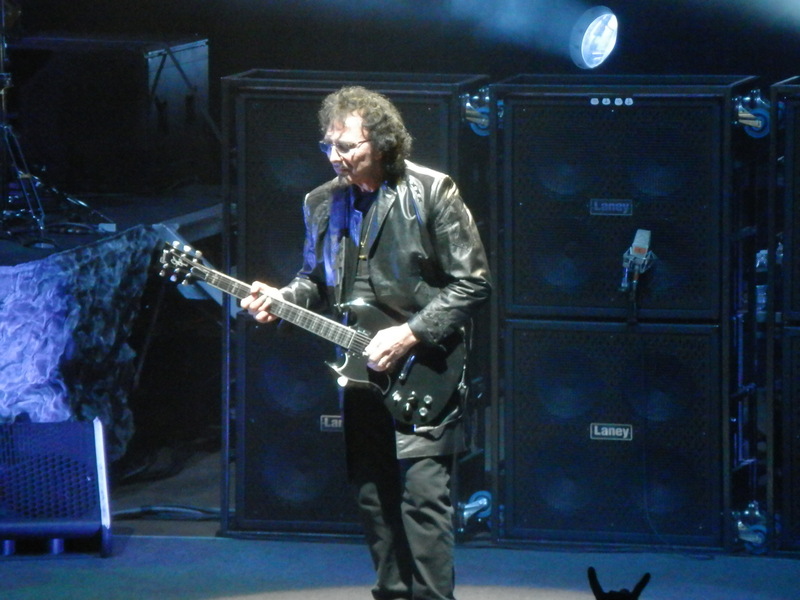 The set list featured original work from their first albums, including War Pigs, N.I.B., Paranoid, Black Sabbath, and Iron Man, as well as new tracks including God Is Dead? and Age of Reason. Not sure this will lead me to collect more metal than I have today – I’ve always been more a fan of keys driven work, but I now have Sabbath sitting in their proper place in the collection, between Bad Company and Camel, and alongside the contemporaries of their day. A rebirth of survivors for this older, newer fan.